Assessment of Learning - Data Literacy - DVD / Video - National Professional Resources, Inc.
Sign up today and recieve 15% off! About National Professional Resources, Inc.
National Professional Resources (NPR, Inc.) has been a leader in the field of education publishing since 1968. Founded and operated by educators with a deep commitment to the success of all learners, our mission is to provide teachers, administrators, and other school staff with quality tools and resources that will better enable them to help every student achieve success. To this end, we publish books, quick-reference laminated guides, and produce videos by leading voices in the field of education. 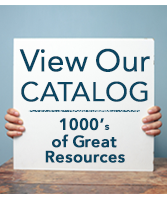 We also carry thousands of the most in-demand educational resources from other leading publishers and producers, including material for parents and students.